What do you know about Dmitri Malama? Was Dmitri Malama in any way related to Dr. B. Z. Malama, honorary physician to the Tsar? Peter de Malama, Bournemouth: "I recently read a book about Group Captain Peter Townsend, best remembered for his ill-fated romance with Princess Margaret in the 1940s and 1950s. It put me in mind of an incident in my family which predates his by 30 or 40 years. In 1914 at the start of World War One my cousin Dimitri de Malama was a young officer in the Imperial Russian Cavalry. In August he was decorated for gallantry and soon afterwards seriously wounded. In the autumn of 1914 the wounded hero found himself in a hospital in St Petersburg. 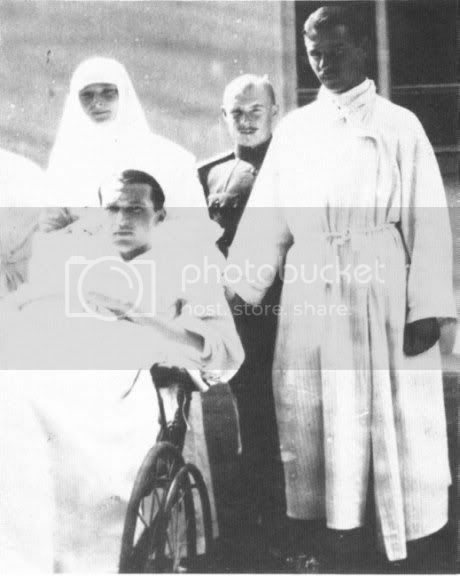 There he was introduced to the Grand Duchess Tatiana, daughter of Tsar Nicholas II, nursing as a sister of mercy. Oct.12 "...Anya brought me from Malama (probably she speaks about Dmitry Malama, officer of the Life-Guards Uhlan Regiment) a small French bulldog (Ortino). It's a very cute little thing. I am so happy..."
"...Ortino and Tatiana are running about the room now. Mother is going to receive Maklakov at 9 a.m. and Malama will come, too, which is very pleasant." "Now Malama comes to tea to say quite goodbye. Goodbye my Angel huzzy. God bless and protect you"
"...Ortino had to be shown to his Father [the visiting Dmitri Malama, who had given the dog to Tatiana] of course..."
Hi Katharina & Elisa ! "...My little Malama came for an hour yesterday evening, after dinner at Anias. We had not seen him for 1 1/2 years. Looks flourishing more of a man now, an adorable boy still. I must say, a perfect son in law he wld. have been - why are foreign Pces. [princes] not as nice! - Oritpo [the dog] had to be shown to his "Father" of course..."
Thanks for posting this complete entry. I did not know the first part. I guess I should try to get hold of Joseph T. Fuhrman's book. What a surprising new information! Both Olga and Tatiana loved Dmitri? So is it possible that "Mitya, the golden one" refers to Dmitri Malama? Please have a look at the thread called "Olga Nikolaevna's first love" and let me know what you think! Both sisters in platonic love with the same officer? Did they realize each other's feelings? Did Malama prefer Tatiana's presence ? (As far as I know, Ortino was a present for Tatiana only, not for both of them). Although it has been stated in several places that Dmitri Malama was the "Mitya" of Olga's affections, I wonder if she would be in love with someone who was the focus of Tatiana's affections. :-/ From what I've read, the sisters had a close and harmonious relationship. No signs of competition seem to have ever been noted, perhaps because each had strengths and abilities that the other did not have. So a relationship of mutual respect and admiration would not, I don't think, have included a serious competition for the affections of one man. Remember also that Dmitri was a fairly common name. The ball book you're talking about talks about Pavel Voronov, a Standart officer, who Olga apparently had a crush on, who ended up married (and OTMA were at the wedding!). Yes, I have read of this attachment. "He (Clark R. Mollenhoff, a Pulitzer prize-winning investigative reporter) would be ideally suited to ask the CIA why it never questioned the four men now in the United States who knew the real Alexei N. Romanov well and were in a position to determine whether Goleniewski is he. They are Kyril de Shishmarev; Count Alexis Buxhoeveden, cousin to Baroness Buxhoeveden, the Empress Alexandra's lady in waiting; and two officers on the Czar's yacht Standart -Baron George Taube and Paul Voronov." Does anyone knows more about Voronov -where he lived, when he passed away, etc.? Now, would Mitia be the nephew of Dr. Malama? And in 1917 would he be with Olga Alexandrovna and her family in the Crimea and the other Romanov refugees and their associates? And if it is him, did he then elect to stay and fight, rather than leaving as many of them did, eventually dying in Ukraine in August 1919 as the first posting notes? Or, is Mitya someone other than Dmitri Malama--i.e., a member of the party that leaves Russia? Also, I remember reading that Olga N. records in her diary how Mitia is very much like his mother. So, would Mitia's mother have therefore been a lady of the court? Or someone associated with the hospital? And if Mitia, Olga's special friend, is Dmitri Malama, where does that leave Tatiana? She seemed to receive the most gifts and attention from Malama . . . or did she?! I do think we're on to something . . . The pieces may be fitting together, but we need a few more critical pieces . . .
Peter de Malama recently wrote about his cousin's romance with Tatiana. The article "The Romanovs - the Forgotten Romance" was published in the December 2004 issue of Royalty Digest. elsa, who wrote "Amidst the sound of the ball" please. Katharina, Can you please tell me what the title of the book by Joseph T. Fuhrman is. Malama is new to me. I didn't know Tatiana liked anyone. You mean there is a picture of Malama ? Would you please post the link . Thanks, I always wanted to see the guy. This is might be slightly off-topic but I think it was on this site I read that according to Anna Virubova, lieutenant Rodionov had a crush on TN. There are quite a few pictures of him with OTMA, including some cute ones of him holding hands with TN (as on p.162 of Prince Micheal of Greece's "The Family Albums"; sorry, no scanner :-/). There's another one with Tatiana and Olga inbetween Malama from a larger group at the hospital but I'm too lazy to go get it. From what I understand Tatiana named her dog Ortino because Malama's favorite horse was named Ortino!